Little House Home Arts: My Free Fruit Pincushion Give- Away This Week--in Memory of our Mothers! My Free Fruit Pincushion Give- Away This Week--in Memory of our Mothers! Years ago I went to the funeral of a friend’s mother and as the priest looked out on those gathered, he let us know that this mother had completed her days and that her children were the “fruits” of her life. None of us missed the humor in his words, as we later teased my friend about being a “fruit”. She was a woman with a great deal of humor and laughed at the priest's chosen word to describe her. I am reminded as Mother’s Day approaches however, that we are all “fruits”—some peaches, some lemons. The variety is really unending, and some ripen well and others, not so much. I am the mother of two young adult women though I must remind myself here and there that although they are raised, they are not yet finished. Are any of us really finished learning all that we need to know to deal with the challenges we face? One of my daughters is back home living with us and the other is “on her own” though she may "rebound" at any time. Both have graduated from college and are now in the throws of paying off their college debts. They are, of course, above average and “the apples of my eye”... but I am still not done “mothering them”, nor will I likely, ever be, though now I try to use less words, or at least use them faster as they they have wings now and don't let me "mother them" like in days of old! Back in the days that my kids were young a friend of mine, laughingly told me that after confessing to our priest about being impatient with her children and their ways, he wisely gave her a good penance. She was to say The Hail Mary a little different each day for the weeks that followed. She was to substitute her name and change the prayer into a mother’s prayer. Guilty of the same transgression, I translated this version to fit me. It goes “Hail Jane, full of grace, the Lord is with me. Blessed am I among women and blessed are the fruits of my womb, Hannah and Sarah Kate, though they seem to be hard of hearing, and stubbornly do as they like despite my good instruction. Holy Jane, mother of these dear but challenging girls, I commit to praying for these sinners along with my husband and myself who are sinners too, now and all the days of my life. Amen. As any mom will tell you, being a mother is a life-altering event. Once a mother, always a mother, no matter what age your children are, and how self-sufficient they have become, you never stop loving them and sadly many of us never stop worrying about them and/or feeling the need to mother them as well. We don’t always know exactly how to do what is best for them and likely I am not the only mother that has regrets over something that we would do different if only we could? There are no "do-overs", but then children are all so different and none of them come with a user’s manual. I had an uncle that used to say that all first-born should be disposable for all the mistakes we make with them, but I added my second in that disposable category...and it seems that my younger brother and sister, numbers three and four, weren't so perfect either. We are all fruits, no matter our successes and failures and our mothers were there to love us unconditionally in their own way. 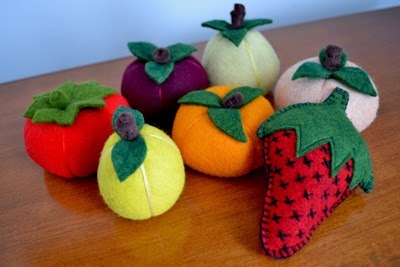 In honor of mothers everywhere and their “fruits”, my Common Thread Give-Away gift this month will be a fruit pincushion of choice to the lucky winner. Let me see, that could be an orange, lemon, peach, plum, pear, strawberry or tomato. It will be the “winner’s choice” of whatever fruit they choose. You may either pick the fruit you think you are most like or the one you would most like to be. All you need to do to win is to leave a message on my website, along with the sort of fruit that you would like to win and the winner will be chosen at the end of the week. Please check back then to see if you are the lucky winner and redeem your prize. Meanwhile take good care of your mothers, and value yourself and others as the prized “ fruits” we really are! Thanks-be for mothers everywhere! May all mothers everywhere have a Happy Mother's Day! And if you aren't a mother and merely "a fruit", may you have a Happy Mother's Day too! What a lovely notion. Fruit of the womb. I would treasure the plum! Being a fruit and not a mom, I'm looking forward to celebrating Mother's Day with my 86 year old mom on Sunday. I'd choose the pear, though they're all lovely and look good enough to eat! Thanks for the give-away! What sweet pincushions, Jane! The colors are a bit off on my monitor, but do I see a pear among them? Thank you for sharing both your thoughts on mothering and the beautiful work of your hands! UPDATE: Webmaster Hannah Here... There has been an issue with our comment plug in as of late last night. Fear not! If you left a comment that does not appear here, I have received it via email and you will be entered in the drawing! Feel free to continue commenting below, We will also be accepting comments on the facebook page so please feel free to comment there as well! Love the idea that we are all fruits of our mothers! Mine was a peach, not sure what I am! Strawberries - the only fruit with the seeds on the outside. Wearing their gift of the future like jewelry. What a lovely post. Your pincushions are beautiful! I love the grape, purple is my all time fav color! I'd love one of these beauties! My 7 year old just started sewing lessons and thought the cute tomato pin cushion I bought her was so fun - but these are much much nicer. Thanks! The fruits are all so lovely, the plum is my favorite. I love the notion that we are fruits of our mother's lives, and that my daughter and her daughter are fruits of mine (wonderful, beautiful fruits). The strawberry - I could never pick them fast enough for my daughter! I'd love to win a pincushion, I think a peach, to remind me of childhood holidays in France, with my Mum, Dad & 2 sisters, when we always ate loads of freshly picked peaches. Now I live in the USA, and they are still all in the UK. Every time my parents visit, my Mum and I work on quilting projects together. Regarding why I'm Iike the fruit I'm picking, obviously it would be because I smell nice and am sweet, and you should handle me gently, so that I don't bruise! I would be thrilled to receive the peach pincushion.